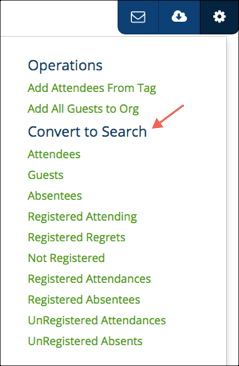 TouchPoint has several Convert to Search options on a Meeting page. These are all found on the blue Toolbar under the gear icon These give you a quick and easy way to communicate with one of several groups of people. Clicking any of the links will take you to Search Builder with the search built on the fly for you. Once you run the search, you can use the Toolbar to send an email, generate a report, and more. Use RSVPLinks and RegretsLinks to register a member’s intent to attend a meeting or their regrets. You can also set those commitments manually on the future meeting, by selecting Enable Editing and Register, then clicking on the person’s commitment and selecting the one you want.